"If human beings are perceived as potentials rather than problems, as possessing strengths instead of weaknesses, as unlimited rather than dull and unresponsive, then they thrive and grow to their capabilities." Barbara Bush often jokes that her successful life is a result of marrying well. Her husband's service as Vice President and President of the United States provided her a unique opportunity to make a wonderful difference in the public eye. Barbara Bush’s signature cause is family literacy, a passion that began during the 1980s when statistics showed that 35 million U.S. adults could not read above the eighth-grade level. During her husband’s vice-presidential years, she unveiled billboards, visited Head Start and Even Start classes, supported alternative school programs for at-risk students like Cities in Schools, and participated in a variety of media programs to raise awareness of the basic need for every citizen to be able to read. In 1984, Mrs. Bush also published C. Fred’s Story: A Dog’s Life, which raised $100,000 for Literacy Volunteers of America and Laubach Literacy Action. As First Lady, Mrs. Bush took the family literacy movement to a new level of national awareness when she launched the Barbara Bush Foundation for Family Literacy, focusing simultaneously on early childhood education for preschoolers and adult literacy for their parents. 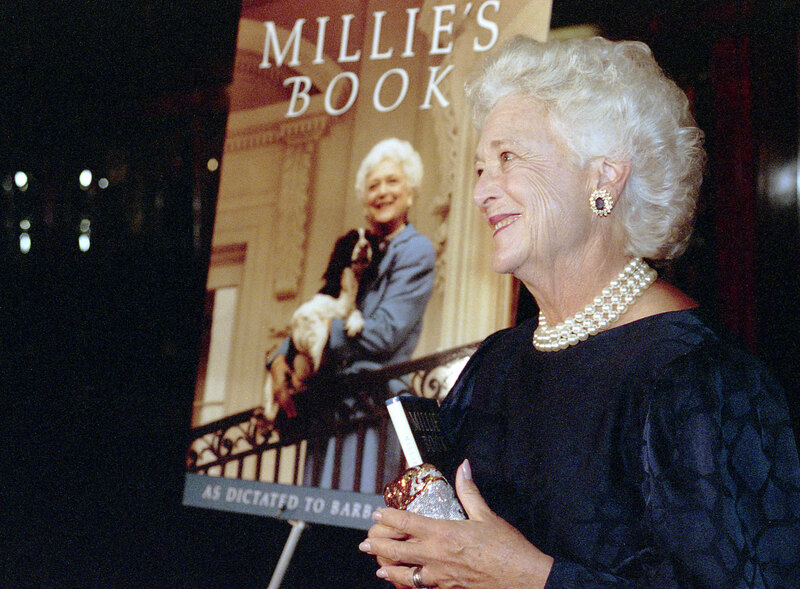 In 1990, she published a second book, Millie’s Book: As Dictated to Barbara Bush, which sold more than 300,000 copies in its first year and raised nearly $900,000 for her new foundation. She also launched Mrs. Bush's Story Time, a national radio program that stressed the importance of reading aloud to children. In 1991, Mrs. Bush and other advocates celebrated the passage of the National Literacy Act, which created the National Institute for Literacy and permitted the use of libraries and other municipal property as evening literacy centers for adults. Since leaving the White House, Mrs. Bush has continued to volunteer her time to worthy causes and help others. Her Foundation for Family Literacy, from which she stepped aside in 2014, has raised and awarded over $50 million to create or expand family literacy programs in all 50 states and the District of Columbia. She also served as AmeriCares ambassador-at- large; a Mayo Clinic Foundation board member; and a supporter of organizations including the Leukemia Society of America, the Ronald McDonald House, and the Boys & Girls Club of America. Born in 1925 to Pauline and Marvin Pierce, she grew up in Rye, New York, where she met and later married George H.W. Bush on January 6, 1945. They have four sons – George W., Jeb, Marvin, and Neil – a daughter, Doro, 17 grandchildren; and seven great-grandchildren. The Bush family's second child, Robin, died in 1953 at the age of three after fighting leukemia. Several schools have been named for Mrs. Bush, including middle schools in San Antonio and Irving, Texas; and elementary schools in Houston, the Dallas suburb of Grand Prairie, and Mesa, Arizona. Also bearing her name is the Barbara Bush Children's Hospital at Maine Medical Center in Portland. Mrs. Bush chronicled her life’s story in two autobiographies: Barbara Bush: A Memoir (1994), which covered her life through her husband’s term in office; and Reflections (2004), which focused on life after the White House and her first son’s ascension to the presidency. A former First Lady of the United States of America and relentless proponent of family literacy, Barbara Pierce Bush passed away Tuesday, April 17, 2018 at the age of 92. She is survived by her husband of 73 years, President George H. W. Bush; five children and their spouses; 17 grandchildren; seven great grandchildren; and her brother, Scott Pierce. She was preceded in death by her second child, Pauline Robinson “Robin” Bush, and her siblings Martha Rafferty and James R. Pierce. Her husband’s election as the 41st President elevated the plain-spoken, faux-pearl wearing, distant relative of President Franklin Pierce to First Lady from January 20, 1989 to January 20, 1993. Aware that she was not elected and carried no official duties, Mrs. Bush instructed her staff: “Each day we should do something to help others.” So along with the endless entertaining and public ceremonies, she went to soup kitchens, homeless shelters and senior centers. She participated in events supporting worthy causes from veterans’ hospitals, to teen pregnancy programs and the Boys & Girls Clubs. Notably at the time, Mrs. Bush visited facilities for AIDS victims, held infected babies and hugged adults. In so doing, she helped erase the stigma of that disease, and encouraged her husband’s administration to increase funding for AIDS research and treatment. Mrs. Bush also came to the rescue of the Salvation Army in 1989, when several Washington, D.C. area malls decided to ban the Army’s red kettle bellringers claiming they were a nuisance to Christmas shoppers. Outraged, the First Lady made a very public trip to a local mall that was allowing the bell-ringers, and dropped $10 into the red kettle. That ended the ban then and there. But Barbara Bush’s signature cause was literacy, a passion that began during the 1980s when statistics showed that 35 million U.S. adults could not read above the eighth-grade level – while 23 million were at or below fourth-grade proficiency. Inspired by business leaders like publisher Harold McGraw, public officials like Gov. Jim Edgar of Illinois, and other literacy advocates across the country, Mrs. Bush quickly came to believe that, in her words, “if more people could read or write, we could be much closer to solving so many other problems that our country faces.” Furthermore, she recognized the vital importance of family literacy – ensuring literacy programs were accessible to help struggling parents and children so they would have an equal chance to succeed in life. Her literacy advocacy gradually expanded with her public profile. During her husband’s vice-presidential years, for example, she unveiled billboards, visited Head Start and Even Start classes, supported alternative school programs for at-risk students like Cities in Schools, wrote dozens of articles, and participated in a variety of media programs to raise awareness of the basic need for every citizen to be able to read. In 1984, Mrs. Bush also published C. Fred’s Story: A Dog’s Life, which raised $100,000 for Literacy Volunteers of America and Laubach Literacy Action. 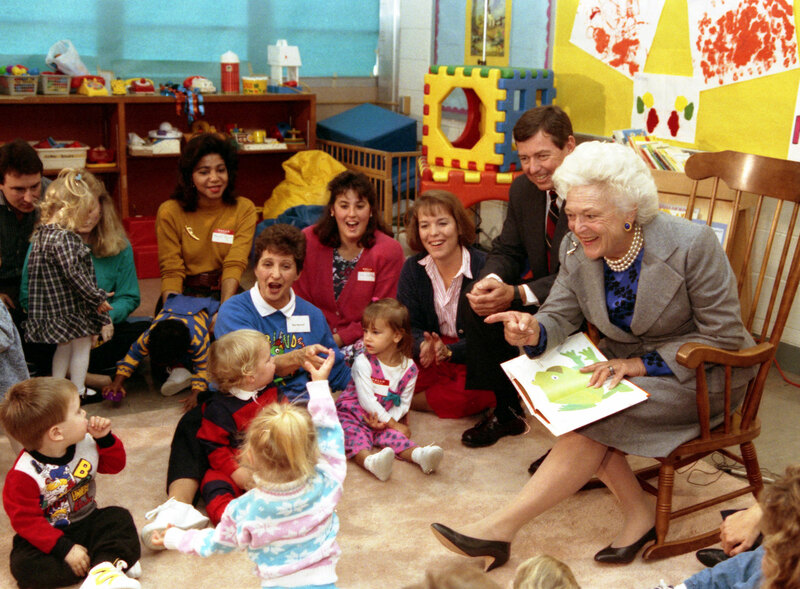 Then starting as First Lady in 1989, Mrs. Bush took the family literacy movement to a new level of national awareness when she launched the Barbara Bush Foundation for Family Literacy, focusing simultaneously on early childhood education for preschoolers and adult literacy for their parents. In 1990, she published a second book, Millie’s Book: As Dictated to Barbara Bush, which sold more than 300,000 copies in its first year and raised nearly $900,000 for her new foundation. She also began Mrs. Bush's Story Time, a national radio program that stressed the importance of reading aloud to children. In 1991, Mrs. Bush and other advocates celebrated the passage of the National Literacy Act, which created the National Institute for Literacy and permitted the use of libraries and other municipal property as evening literacy centers for adults. After leaving Washington, Mrs. Bush continued to volunteer her time to worthy causes and help others. Her Foundation for Family Literacy, from which she stepped aside in 2012, has raised and awarded over $110 million to create or expand family literacy programs in all 50 states and the District of Columbia. She also served as AmeriCares ambassador-at-large; a Mayo Clinic Foundation board member; and a supporter of organizations including the Leukemia Society of America, the Ronald McDonald House, and the Boys & Girls Club of America. Of course, Barbara Bush shares the rare distinction with Abigail Adams of being both a wife to, and mother of, a president. She addressed both the 2000 and the 2004 Republican National Conventions that nominated George W., and actively campaigned for him during both national campaigns. In 2016, at the age of 90, she also campaigned for her son and former Florida Governor, Jeb, as he vied for the Republican presidential nomination. Another unique political moment came in November 1998, when George W. was re-elected Governor of Texas and Jeb was elected to the first of his two terms as Governor of Florida. Today, her grandson, George P. Bush, serves as the newly re-elected Texas Land Commissioner. Barbara Pierce was born in New York City on June 8, 1925, the third of Marvin and Pauline (nee Robinson) Pierce’s four children. She was raised in Indian Village in Rye, New York, and received her primary education at Milton Public School and Rye Country Day School before attending Ashley Hall, a boarding school in South Carolina. At a December 1941 Christmas dance, neighborhood friend Jack Wozencraft introduced 16 year-old Barbara to her future husband, “Poppy” Bush of Greenwich, Connecticut. They danced briefly and sat out the waltz that followed, chatting for 15 minutes. The courtship that followed was largely conducted courtesy of the U.S. Postal Service, as George had already determined he would join the fledgling war effort following the attack at Pearl Harbor. They were secretly engaged just before George Bush was dispatched to the Pacific where he flew torpedo bombers. After his honorable discharge at the end of World War II, Mr. Bush enrolled in Yale University, and the newlyweds moved to New Haven, Connecticut. There, the couple's first child, George Walker Bush, was born on July 6, 1946. Mr. Bush graduated from Yale in 1948, and immediately set out for Texas and the oil business – sending for his young family once established in Odessa. The first of their 30-plus residential moves during their marriage took them to various towns in southern California before they settled in Midland, Texas. Tragedy struck twice early in the Bushes’ marriage: first in 1949 when Barbara’s parents were involved in a car crash that killed her mother, Pauline; and again in 1953 when the Bushes’ second child, three yearold Robin, succumbed to leukemia. They welcomed three more sons while in Midland – John Ellis or “Jeb,” Neil and Marvin. In August of 1959, the Bushes moved to Houston and welcomed their second daughter, Dorothy or “Doro,” that same month. The dawn of George H. W. Bush’s career in elective politics in 1962 introduced Barbara Bush to the campaign trail that she would relentlessly tread for the next 54 years on behalf of her husband, her friends and political allies, and her family. The family moved to Washington, DC in late 1966 following Mr. Bush’s election to the U.S. House from Texas’ seventh congressional district; and to New York and the Waldorf Hotel in 1971 following his appointment by President Nixon as Ambassador to the United Nations. Other presidential appointments, and family moves, followed: Chairman of the Republican National Committee back in Washington; Chief of the U.S. Liaison Office in Beijing (then Peking); and Director of Central Intelligence in northern Virginia. The Bushes returned home to Houston after the 1976 election, where Mr. Bush quietly assembled a team and prepared to mount his 1980 candidacy for the presidency. He accepted Ronald Reagan’s offer as running mate, and was sworn in as Vice President on January 20, 1981. Despite the demands and visibility of being First Lady, Mrs. Bush called her eight years as wife of the Vice President – from 1981 to 1989 – “the busiest of my life.” In all, she spent 1,629 days and 1.3 million miles traveling away from Washington. While in the Nation’s Capital, she hosted 1,192 events and attended another 1,232 events during the same span. Several schools, libraries and parks have been named for Mrs. Bush, including middle schools in San Antonio and Irving, Texas, and elementary schools in Houston, Texas, the Dallas suburb of Grand Prairie, Texas, and Mesa, Arizona. Also bearing her name is the Barbara Bush Children's Hospital at Maine Medical Center in Portland. Mrs. Bush chronicled her life’s story in two autobiographies: Barbara Bush: A Memoir (1994), which covered her life through her husband’s term in office; and Reflections (2003), which focused on life after the White House and her first son’s ascension to the presidency. A Memoir was re-released with updated introductions by her children in 2015 to coincide with Mrs. Bush’s 90th birthday. 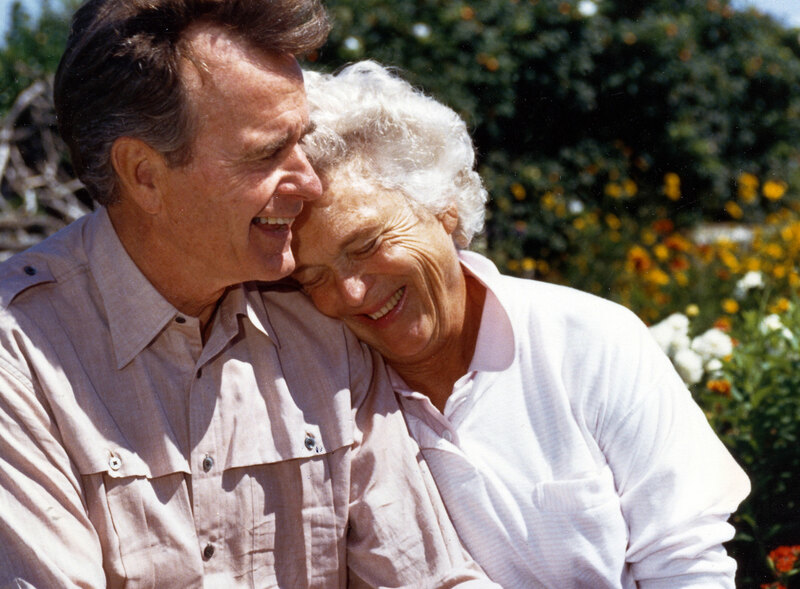 In lieu of flowers, donations may be made to the Barbara Bush Foundation for Family Literacy at http://barbarabush.org/.